The public are invited to enter teams into a charity fundraising event being held in aid of the Catherine McEwan Foundation on Saturday 12th May 2018 at the GHA Rugby Club in Giffnock, Glasgow. There’ll be lots to see and do on the day, even if you’re just a spectator attending the day just to cheer on the teams and support the charity. Also, remember teams that you get to play a ‘Joker’ on one game (which will get you double points on that game), so if you’ve also designed and brought your own Joker Card you’ll get even more bonus points. So get some friends together and enter a team into this great event for a great local charity. The day starts at 12.00 midday. There will also be refreshments, sideshows, bouncy castles for the kids and other attractions. If you can’t make the date, but would like to enter a team into one of our charity events, then we more that are listed on our Public Events page of the website. 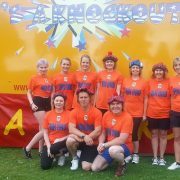 The general public are invited to enter teams into the Friend’s of ANCHOR charity It’s A Knockout event in Aberdeen. As usual, the event is being held over two days at Hazlehead Park in Aberdeen on Saturday the 18th and Sunday 19th August 2018. ‘ANCHOR’ stands for Aberdeen and North Centre for Haematology, Oncology and Radiotherapy. The ANCHOR Unit covers the dedicated wards and clinics within Aberdeen Royal Infirmary for oncology and haematology patients. Friends of Anchor Aberdeen 2017. Previous years have been a great success for the charity and we’ve always been blessed with great and fun teams who turn up in sometimes amazing and creative fancy dress, bringing mascots, joker boards and supporters. As usual, there will be lots going on that day including side shows, refreshments, local stalls and amusements. So even if you can’t enter a team, please come and visit the event to support a great worthwhile local cause. Friend’s Of Anchor Aberdeen 2017. This years games are from our twelve game Gold Show It’s A knockout once more. 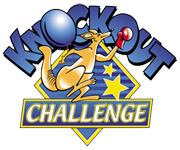 We’ve got some new games in the mix this year including Kitchen Kaos, Pac Man and a new Bubble Pit, so even if you’ve entered a team into previous events, you’re sure to repeat the fun again in 2018. So, why not get some friends together, family, workmates or colleagues and enter a team into this great charity event and we’ll se you there! Teams can be from 6 to 10 in number. A team can have more than ten members, but we can’t then guarantee that everyone will get a go on every game. Teams will be required to gain sponsorship to take part. The money going to the Friend’s of Anchor charity. To find out more about the day please Contact Us. The Aberdeen and North Centre for Haematology, Oncology and Radiotherapy is a bit of a mouthful, that’s why it’s better known as ANCHOR. ANCHOR is a department at Aberdeen Royal Infirmary which treats patients with all forms of cancer, leukaemia and benign blood disorders throughout the North-east of Scotland including Orkney and Shetland. ANCHOR needs constant investment in technology and research to provide the best possible outcome for cancer diagnosis and treatment – this is where Friends of Anchor comes in. How Do Friends of Anchor raise funds? Well, this is where you come in! Friends of Anchor work tirelessly to find ways to make their fundraising fun and rewarding, and Anchor Wipeout certainly achieves that! 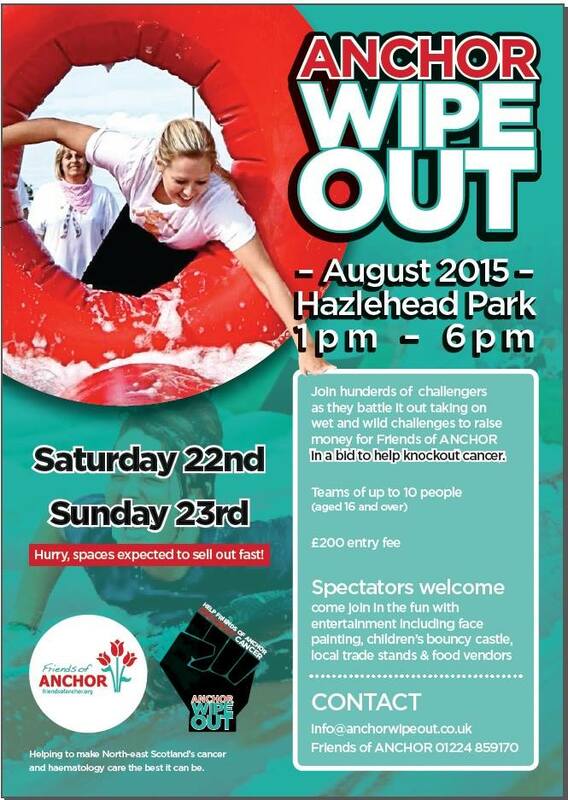 Join 100s of other challengers for a day of wet and wild fun ! All you need to do is get a team together, pay £200 entry fee (for a team of up to 10 people), turn up on the day and have as much fun as possible! 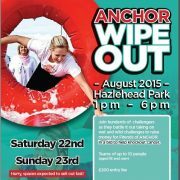 Spectators are welcome, and there will be plenty to keep them entertained – food stalls, bouncy castles, face painting etc – as well as watching the Wipeout antics. Come on, a day out in the fresh air, fundraising for a wonderfully worthwhile cause, time spent with family and friends, and a lot of laughs along the way. How can you refuse?